Looking for something on Instagram? It’s now a whole lot easier. 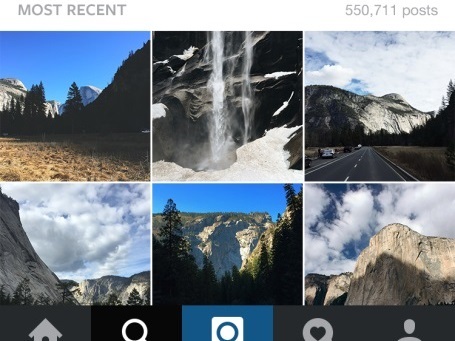 Instagram announced two significant updates Tuesday: a revamped Explore page, and the ability to search for places. The new Explore page contains photos and videos related to trending hashtags and places, in real-time. Through trending tags and trending places, you can experience moments like #bonnaroo or #fathersday from every perspective. Rich visual content captures everyone’s unique take—not just what the community is talking about, but also what they’re doing and seeing. In addition, at the top of the Explore page, you will find new curated collections that will be updated regularly, featuring interesting accounts and places, from musicians and extreme athletes to stunning architecture and gorgeous beaches. To start, these updates to Explore will only be available in the U.S. We’ll work to bring it to the rest of the world after we fine-tune the experience and set it up to work well in other countries. For everyone on Instagram, we’ve dramatically improved the ability to find what you’re looking for. With the new places search, you can now peer in at just about any location on earth, allowing you to scout out your next vacation spot in the South Pacific, get a look inside that hot new restaurant or experience your favorite music festival—even if you couldn’t make it this year. The new top search also lets you search across people, places and tags all at once. Readers: What do you think of the updates?